rodgersantiques.co.uk » Japanese Toy Companies : DAIYA TOYS – TERAI TOYS Co.
Home > General Discussion	> Japanese Toy Companies : DAIYA TOYS – TERAI TOYS Co. Formed in Tokyo sometime in the 1950′s, Daiya was typical of many of the Japanese tinplate toy companies of the time being most active from the mid-late 1950′s through to the late 1970′s,after which the company appears to have dropped off the radar. 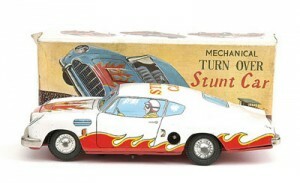 Daiya produced a good range of tin toys including civilian vehicles, space vehicles including robots along with other space related toys – rays guns etc., as well as several other novelty tinplate items. Daiya was typical of many of the post war Japanese tinplate toy companies in so much that many of its mechanical tin toys, whether they be clockwork or battery operated, were produced with multi-functional features such as operating lights and sounds etc. 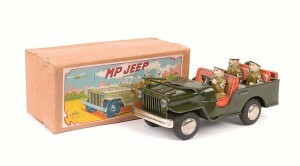 Tinplate model dating to c1950 in military dark green bodywork finish with detailed tinprinted interior, seated figures. Plated parts, spare wheel, jerry can to rear and fitted with folding tinplate windscreen, 26cm. 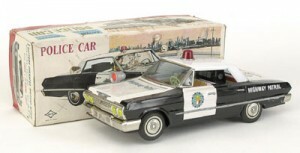 Battery operated model of a Highway Patrol Police Car based on a Chevrolet Impala. Model is finished in typical black and white colourway finish with detailed interior. Plated parts, working light, 32cm. 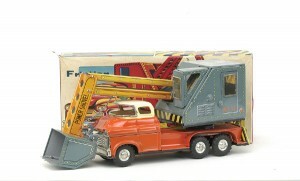 Tinplate friction drive model of a Lorry Mounted Power Shovel, orange cab and chassis with cream roof. Grey excavator mounted to rear with orange jib and grey shovel. 6-Wheeled truck is based on a GMC vehicle, detailed tinprinting with plated parts, 28cm. Pictured opposite are a pair of Daiya battery operated Porsche sports cars with remote control. One is a closed top version in red bodywork finish with yellow stripes, detailed interior, racing number ’77′, plated parts. The second is an open topped model with racing number ’24′ in blue finish, detailed interior, plated parts. 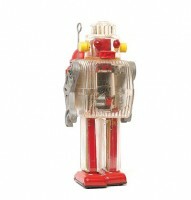 A 1950′s battery operated plastic robot figure with visible motor. The ‘Ranger Robot’ has see through body and legs, silver plastic arms with red tinplate feet, 27cm. Robot walks, has moving arms, lights, voice sounds and smoke emits from the mouth. 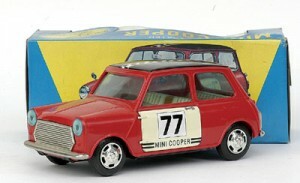 Large scale plastic and tinplate model of a British Mini Cooper, model shown in red colourway finish with a black roof although other colours were produced. Racing No. 77 to sides. Fitted with bright plated parts including hubs. Battery operated with variable speed control, 19cm. Tinplate representation of the British Aston Martin, clockwork in operation with ‘stunt’ action. Vehicle shown in white colourway finish with red/yellow flame effect trim although other colours were produced eg: red with a chequered design to doors and bonnet. In all cases ‘Stunt Car’ lettering appears on the roof. Tin-printed driver detailed to ‘windows’, 18cm. I have a daiya friction tin type continental trailways tandem bus (2 sections hinged in the middle). Any idea of its worth, or someplace I could go to find out ? Can I assume you aren’t based in the UK as Daiyas Continental Trailways tandem bus would be termed an articulated bus over here. Honestly I have only seen the single coach variant, termed the ‘Golden Eagle’, the bus would date around the late 50′s to late 1960′s and is friction powered as you say. Interestingly a couple of the single buses recently sold on Ebay for £18 and £30 respectively. Looking back in my reference books I can find one ‘tandem’ that sold back in 2002 however that was in a lot with two other items selling at UK£130, so that’s not much use. Also several listed in the States with asking prices of $300 – $500 ! and I can find one selling at Morphy auctions, Denver, for US$236 in 2011. Hope that is of some help. 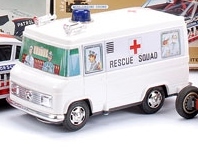 Have you ever seen an ambulance car from Daiya – plastic and tin, says Rescue Squad on the side? I wonder how old it is and how valuable? Hi Marina, assuming the vehicle is the same as shown in the picture – plastic bodied Mercedes ‘rescue’ ambulance came in a card ‘window’ box. Probably dates to sometime around the late 1970′s I believe. Battery operated 7.5″ x 4.25″ toy with ‘bump and go’ action, sounds and flashing roof light. Opening rear doors to reveal printed figures to inside rear wall. As to its value I am reluctant to say as even in excellent condition, complete with its original box in a similar condition, I would normally expect to see this in a ‘lot’ at auction rather than as a single item. I did find one listed on Ebay without a box at £20, but this not surprisingly did not attract a bid. Hope that is of use, David. Hi there Ross, the Daiya ‘Mini – Mini – Washer’ although not a very common toy dates to around the 1970′s. Unable to find many auction listings for this particular toy hence the delay in responding but one recently sold on the internet complete with box for around $16 . Hope that helps, doesn’t look like you will be retiring just yet. I have a DAIYA Green Caterpillar battery operated remote control tin toy in the box. The you looks like it was never used. Battery box is in pristine condition as well as the caterpillar. The box has a few wear but intact. I try looking for the year it was manufactured and the current value. I find online that it’s very rare and goes for around $300- $500. Don’t know if that’s true since the info was from eBay and other selling sites. Hi there Andy, can’t tell you much about this toy, as far as I am aware its just one of the many clockwork and battery operated toy animals that Daiya produced most of which you can pick up in a box lot at auction for a few pounds. I think the large amount asked for on Ebay by the seller from the States is just wishful thinking as are many of the prices asked for on the internet. Funnily enough I see an unboxed one sold in the states for less than £10. Now if you had an Astro Racer or the Space Conqueror robot from Daiya that would be a different matter ! Will keep digging to see if I can find any Caterpillars that have sold as a single item at auction recently and if so will add it to this post. Sorry I can’t be of more use. Will also keep an eye on the Ebay listing to see if it sells. Hola David, tengo un porsche a pilas Daiya, tiene el número 32, no he podido encontrar referencias sobre los números, encontre el mismo auto conel número 8, tiene algo que ver el número con el año de fabricación?, cuanto valdría el auto que tengo? Translation as follows : Hello David, I have a battery-powered porsche Daiya, it has the number 32, I could not find references about the numbers, I found the same car with the number 8, does the number have to do with the year of manufacture ?, how much would the car be worth? I have? From what little I know Pablo the ‘running number’ on the car is of no significance what-so-ever and has nothing to do with the year of manufacture. Unable to give any idea on price, sorry about that, but without loads more info its impossible. If your cars are the Porsche Carrera models with dual speed control and clear plastic windows all around then I can say they are worth more, especially boxed, than the bog standard Porsche 914 models.